However, parents may participate with their children in many different ways. How well do different formats compare in the treatment of pediatric obesity? The work group was interested in how different treatment formats for pediatric obesity compared. The work group examined research that directly compared different treatment formats. 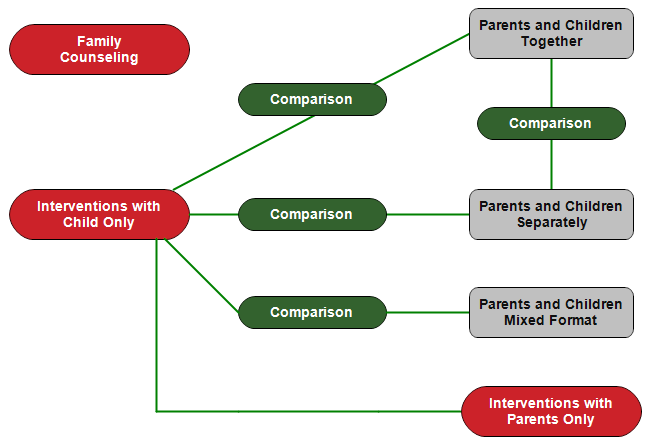 The topical map below provides an overview of the different formats that the group examined. Red items on the topical map link to evidence analysis on that treatment format. Green items link to evidence comparing two treatment formats. Gray items do not have comparative evidence and so are not hyperlinked. Click on any of the topics to go directly to the evidence analysis on that topic, or you may navigate to a topic by using the left navigation bar.